STP-300ZD double-sided printer for simultaneous printing of high performance two-sided heatshrink sleeves used in the defence, aerospace and mass-transit industries. A robust thermal transfer printer with metal cover manufactured for industrial applications and offering excellent print definition and mark permanence. Designed with two print heads this printer prints high volume identification markers sleeves. No extra process of re-winding and re-printing. 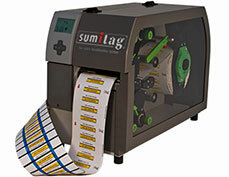 A time-saving solution for wire marking where waste and labelling error is greatly reduced. Printing continuous sleeves the printer can be fitted with a specialist cutter which can perforate or cut marker sleeves to customised lengths.